By Muna Ndulo Professor of Law, Cornell University Law School. It is quite obvious that there is political crisis in Zambia and the country is rapidly descending into a failed state. There is violence everywhere and a breakdown of law and order is evident. Courts are openly being intimidated by politicians, party cadres and Sycophants masquerading as civil society. The Friday September 2 decision of the full bench of the Constitutional Court to give each side two days to present their case is correct in law and in fact. Yet independence comes at a price. In Zambia it is quite evident that in the election petition, the Constitutional Court has come under tremendous pressure and attack by forces that are orchestrated to prevent a hearing of the petition to take place. There appears to be a morbid fear of the evidence to be submitted coming to the surface and hence the strenuous efforts being made to prevent a hearing of the petition. In spite of such challenges the judges must recognize that they are duty bound to provide society with the highest possible standards of service and commitment, and that a failure to maintain this is a betrayal of the judicial oath of office. Independence does not mean that judges can decide cases according to their personal preferences. To the contrary, judges have a right and duty to decide cases before them according to the law, free from fear of reprisals of any kind. The Universal Declaration of Human Rights in article 9 recognizes that: “everyone is entitled in full equality to a fair and public hearing by an independent and impartial tribunal, in the determination of his rights and obligations and of any criminal charges against him.” In a credible judicial process, the petitioners and the defendants must be given reasonable time to present their cases. The court must be alive to the danger that the defendants might employ delay tactics by unnecessarily objecting to motions to prevent a hearing only to turn around to claim that time has run out. The earlier decision by Judge Sitali was impracticable and unreasonable. Besides Judge Sitali made two conflicting decisions. In the absence of the presentation of the case to the Constitutional Court what was the Constitutional court going to decide on? It would shock constitutional lawyers around the world into disbelief to learn that a Constitutional Court in Zambia, after refusing to hear evidenced, turned around and gave what at best would be a technical reason for dismissing a case before it. The principles of natural justice, and constitutional principles the world over require that parties be given ample time to be heard. Various Zambia Constitutional provisions guarantee a right to be heard in a judicial proceeding. That is not law no matter how you look at it. The principles of natural justice, and constitutional principles the world over require that parties be given ample time to be heard. Various Zambia Constitutional provisions guarantee a right to be heard in a judicial proceeding. In any event Article 10 of the Constitution that talks of 14 days is not a model in drafting. It says:” the electoral petition shall be heard in 14 days.” Judicial proceedings involve hearing and determining. The article, by not mentioning determining renders itself to numerous interpretations. Human rights courts the world over have stated that the rights of individuals in the constitution are intended to guarantee rights that are not theoretical or illusory, but practical and effective. The courts the world over where human rights are involved chose an interpretation that provides more extensive protections of individuals. In this case, they would chose, one that gives both sides an opportunity to be heard. Where all parties are given an opportunity to be heard, it becomes easier for all concerned to accept a decision of the court. Zambia Airways demise-Was the decision to ground the airline correct? Thumbs up for a well written article. ‘On the contrary, judges have a right and duty to decide cases before them according to the law, free from fear of reprisals of any kind’…………kikikikiki…….isn’t this a contradiction? What is the law concerning the duration of a petition?The Professors judgement is clouded by his political support for UPND and support for the cartel……..he’s chosen to pretend that he’s dull. If the courts want to disregard my vote using illegal means, I’ll have no option but to defend it myself. Efforts by PF lawyers to prevent petitioners from giving evidence by tactically delaying the hearing is an abomination to justice. Pro Ndulo put rightly by asking what the concourt was going to decide on in the abscence of evidence. Dismissing the case on account of no evidence after preventing the petitioners to be heard is tantamomount to defacating and urinating on the constition. The petitioners have evidence so why not let them submit it without hinderance? The whole idea of stepping aside was meant to prevent abuse of power by the president. Well hyena judges would never judge in favour of a goat ‘s right to life ,would they? I find it dumb when PF tries to protest against going beyond 14 days saying that it is unconstitutional when Lungu is in office unconstitutionally. This case is far from being over, anything can happen, UPND lawyers are just too smart, they got to have the 14 days extended and could win this case. What do you say Ndulo about the voting pattern in Southern Province and Western Provincince where there was massive coercion and intimidation? I don’t expect you to say anything apart from your regionalist view point. And Mmembe is your sponsor. And what do you say about the voting patterns in PF strong holds? We do not have a constitutional crisis but a bunch of lawyers trying and struggling to make sense out of concerned clauses from one piece of document (Constitution) which was just amended. The unreasonable application of trivial demands that overshadowed the main petition on one side and the limited time th Conlaw imposes on the other are the mistakes the petitioner will have to blame. Miyanda thinks that the Concourt was going through the document at the time it was assented to, through the time we were campaigning to the petition day. The Concourt was merely caught napping. They too needed time to figure out the petition at hand. Court abuse in the making! Thus has the Lord of hosts said, ‘Dispense true justice and practice kindness and compassion each to his brother;and do not oppress the widow or the orphan, the stranger or the poor; and do not devise evil in your hearts against one another. But they refused to pay attention and turned a stubborn shoulder and stopped their ears from hearing. The same word came to Zambiah on the 4th day of the ninth month 2016, which was a SUNDAY. …Don’t stop your ears from hearing the Entire Petition. Zambiah 7:1, 8-11 (election events version). May the Lord sanctify the Judges in the truth; Your word is truth. John 17:17. True and only true justice should prevail, in Jesus Name. Well, who does not know that Muna Ndulo is UPND. Before the UPND filed their petition, Muna Ndulo flew in from his base in the US to advise the UPND on the petition. It is therefore not surprising that he is here advising the constitutional court to break the basic law of the land with impunity. Ndulo has written some theoretic article, purely academic. He has misapplied it by trying to fit it in the Zambian context. None of the institutions he has mentioned in his article have failed. When was any of these institutions proven or assessed and found to have failed, and by who? If today I say that prof. Ndulo got his academic papers through plagiarism, does that make his papers fake just based on my suspicion and superstition, or the matter has to be proven as such? Just because HH and GBM are suspicious and superstitious about these institutions does not mean they have failed. Just by have challenges in an election, does not mean ECZ has failed. How many challenges and amendments did HH and GBM have in their own petition? Are they then failures? The petition has legally expired. When making decisions over legal matters, make sure you base your decisions on the law and not fairness. The latter (fairness) is very important and it must always given first priority as long as it falls within the constitution and the law. Never be tempted to pursue fairness that causes you to break the law. The risk is this: when you violate the constitution in preference to fairness, should things go wrong as a result of your decisions, you are unexcusable. If you follow the constitution, God forbid that there be but, anything going wrong you will be covered by the constitution. Emotions are good, that is why God gave us. But regarding constitutional matters we cannot prefer emotions to upholding the constitution. … not open ended. Yet he wants to confuse us by using “IN 14 days”! The constitutional court has dismissed the petition against the election of president ECL on grounds that its mandate lapsed at 23:59 on Friday….game over! (Continued)… true democratic state functions. Undermining the rule of law also undermines the democratic process itself, and leaves it vulnerable to the whims and manipulation of self -serving politicians. The supporters of PF with blind loyalty to ECL may celebrate today, regardless of how they’ve gotten their victory. But the losers are we the people who believe in, and respect, the rule of law. And it’s not about us wanting or favoring UPND to win the petition, and PF losing out. It’s not about being anti PF and pro UPND. It’s about being pro the rule of law.. It’s about wanting the right thing to be done, the rule of law to be respected, and whoever wins after that gains genuine respect both from the national audience as well as the international community. If it was up to me I’d even go so far as to give them 1 full year and see what evidence they would present. The only problem I have is that the petitioners’ rights seem to be regarded as more important than the right of all other Zambians whose lives are at a stand still! Is that justice? You want evidence? We will present it, and it’s overwhelming, and that’s why your minions in the Panga Family tried to cartel the petition. You want to hear it straight? Your president Lungu will not be sworn in as the Concourt will nullify the election. F..ck you sir, madam, hermaphrodite, or whatever you are!!! The PF KanCourt has been caught with their smelly knickers around their noses. The whole bench should have been hearing the petition from the beginning instead of leaving it to Anne Mwewa, a Bemba PF cadre. She obfuscated and dilly-dallied with petty issues until the 14 days were over. She also refused to work weekends and evenings during that time. Lungu was told when swearing in the KanCourt judges that the chosen judges were not experienced judges at all, and the most challenging work most of them had done was property conveyancing. Now we are seeing the effects of Lungu’s pig-headedness. The KanCourt (Kangaroo Court) is a sham and a charade. It cannot deliver justice in any form. @ Umwina Nkana, we are not just dealing with what we will do tomorrow. Whatever comes out of this will effect generations to come. A change I would like to see is that the counting of the 14 days ONLY STARTS once the incumbent has handed over power to the Speaker! Is this not the man who is one of the people that Drafted this Constitution which is full of errors? Now after creating a crisis, he wants to justify his mediocrity. Why put in 14 days when you know it means nothing in a country’s constitution. This is total irresponsible for this so called professor. This man sat with this document for days in and days out and could not even pick up the many flaws in this document, that even laymen like Gen Miyanda did. This Prof is a disgrace to both Zambia and the academic world. This constitution is life and death and to him when drafting and proof reading it ..it was just an ACADEMIC exercise!! I would not be surprised if, in fact some of his Teaching Assistants/Students drafted part of this flawed constitution. The Lungu PF Constitution is not the same draft that was revealed in 2014. Instead, it is a concoction of Lungu and Simbyakula which they put together by selecting so-called non-controversial clauses from the draft. As a result, it is a mishmash of ideas that do not even gel together. PF cadres claim that Prof Mvunga is the architect of this monster. I have my doubts. Lungu is the architect of this stoopidity. Prof Ndulo was not involved in the drafting get your facts right. He was involved in the drafting of the Kenyan constitution. Such delusional bile coming from a professor as an opening paragraph to an analysis clearly shows where his arguments will lean. A professor should be more REASONABLE. Whatever his definitions of ‘justice’ and ‘law’ are, he has not done justice to this matter and clearly he does not respect the Constitution to which he was a contributor. …and what is ‘reasonable time’. I can not believe that, sir, you would want to come on a platform like this one and pretend to be dull. Or ARE you…? Bravo. Quality of your comment is equivalent to the crappy content of your skull. Do you know who is Dr. Muna? What has he achieved alone in his field, is ten times more than all Zambian Constitutional Judges put together. And his achievements are for real. Check before showing your genetically inbred 1mbecility. @Vizungu you’re spot-on. This professor is so useless and clueless. If these are the kind of brains that UPND boast of then Kaya! No wander HH has found himself in this quagmire where demands of evidence is being made on the day the same evidence is supposed to be filed in court, so shameful! Vizungu – Right on – when intellectualism is clouded in partial analyses, it evaporates. Now I understand why George Kunda trashed the Professor. “It is quite obvious that there is political crisis in Zambia and the country is rapidly descending into a failed state. There is violence everywhere and a breakdown of law and order is evident”. How can an acclaimed academician write this troll? Everything below this statement becomes useless because of such unmitigated bias. Whilst we appreciate that you expected your side to win, and are now hurt Professor Ndulo, let me remind you that we did not react the same way you are behaving when RB lost, after your “Comedy of Errors” essay. Interesting how all of a sudden everyone has become a qualified lawyer to fully interpret the law. Article 10 which mentions 14 days is subject to debate. Is the 14 days inclusive of weekends or 14 working days when the Concourt is sitting? Strange how we can demean our Concourt Judges and Prof Ndulo. Let’s give the Concourt Judges chance to carry out their job in a conducive environment without pressure and intimidation. I had respect for Prof Ndulo as an academician but he is no different from Neo Simutanyi…if he feels he can help HH why can’t he come in on the next set of new lawyers as HH applied to the ConCourt…What most of us are condemning is the U turn from the judges after making it clear that there would be no extension to the days according to the stipulated time enshrined in the Constitution…Prof Ndulo is not telling us what the 14 days entails even if it means not hearing the evidence bcoz the UPND lawyers spent time on preliminary issues without focusing on the the main argument for their client’s cause….It is not right just to support because one is a tribeman. This is a masterpiece from Prof Muna Ndulo. The Petetion Hearing must proceed today and no more time wasting by Lungu Lawyers. Any petetion to reverse the Concourt Extension must be dismissed. If the Lungu lawyers try to walk out Concourt must reject permission. The Hearing must go on. We want to know how our votes were stolen. Lungu must step aside today and handover power to Dr Matibini as Acting President as a pre-condition to the Hearing. Let the play begin. Ba Chibwe kwisa bami ibile. Amalanda kanwa teyakumfwila! Only God can say! When God says yes no man can say no. Despite Prof Ndulo’s vast legal knowledge, he can’t tell us the other interpretations that article 10 might mean. Truth of the matter is, he knows the interpretation but he is ignoring the truth simply because of his vested interest in the matter. From the UNZA Law school days, Prof Ndulo has demonstrated favoritism to tribesmen some of whom despite having PhDs, have failed to pass ZIALE exams. SAD!! Did he fail you because you are Bemba? Don’t disguise your hatemongering because of tribe. If Ndulo is that biased, how come he has proven himself in a meritocratic American University for years? Your tribal backwardness and stoopidity cannot be cured by education. This is where you have a problem. You quickly resort to insults. Why did you challenge me to prove my claims? If you challenge me to mention the name/names, I will be glad to do that. Bo Muna Ndulo, the HH you are supporting is a tinpot dictator in making. The only justice HH sees is his justice and not for anyone else. If you want a Tonga President, don’t push this HH to us, look for a better one, the guy wants to benefit from democracy when he doesn’t believe in democracy. Ask him when his party went to a convention, all top positions in his party are appointees and the so called party manifesto is a personal document. What a petty guy you are supporting? Be assured, we can’t allow HH to be President of Zambia. Let him go and enjoy! the proceeds of privatisation of our companies, very unpatriotic fellow. Chanda beu for your own information professor Muna Ndulo had no part in the current Zambian constitution. He even criticized it after he read it. But unfortunately there are more people like you who speak from hear-say instead of facts. Why did he not contribute? Why does he want to be a champion now? Such a USELESS and unpatriotic fellow. Let me him jump into a lake…! Do you 1mbecile know where Dr. Muna lives and work? Me I don’t mind continuing like this even for the next 2 months as long as justice prevails it’s okay.Believe me fellow citizens INJUSTICE is what will bring chaos.The Concourt did well to give each party equal time to present their case.This is the way it should be.Justice must be seen to be done.If Edgar Lungu was genuinely voted for by the Zambian people the Concourt will say so.Nothing to fear.If some people are afraid then you know what that means. The delay in the Petetion Hearing should be blamed mostly on Lungu and his PF lawyers who were refusing to be served with the Petetion. The Petetion lawyers were beaten by soldiers at State House trying to serve papers to Lungu. Concourt did not help matters becoz from the outset they should have outlined what was going to happen in terms the Petetion Hearing time and transitional matters like Lungu stepping down and Speaker Acting as President etc. Concourt should have set parameters for the Petetion Hearing. Read the constitution sir. The president is immune to that. The Author sounds like a bitter chap living away from reality for a long time or simply a person who does not really care about preserving the image of this Country at all. Zambia is not in any way closer to a failed state which the common language for UPND sympathizers. According to some people like the author Zambia is failed as long as a Tonga does not come to power. They have no respect for the other 72 tribes. Please, you can’t last a minute without making reference to tribe and partisan politics. Why don’t you engage the writer but presenting your rebuttal arguments on an intellectual level? This is what is troubling this country… the so called educated spend time bickering over nonsense instead of discussions that are informed and backed by facts or articulated opinions. I’ll be waiting your piece debunking what the Prof has written here. @Maverick: You want me to lie? I will repeat because that is what I mean. Zambia is a failed state as long as we have not elected a UPND Tonga. How else do you want me to right this fact. Ken and his “intellectual level”? He does not even know who is Dr. Muna!!! He think is a Doctor like “Dr. Kambwili”!!! @Ken exactly my observation. This professor is pathetic to say the least. If Zambia is a failed state then the entire world is a fallen world. His definition of a failed state is so slapdash and myopic to say the least. Prof Muna Ndulo of Cornell and his younger brother Professor Manenga Ndulo of the Economics Department at UNZA are both paid up and committed members of the UPND. I know what I am talking about because I know both brothers very well. In fact, Prof Ndulo of Cornell is one of the fundraisers for the UPND in the USA. He therefore cannot deny that he would like to see HH ascend to the Presidency of Zambia. Even though he has articulated his position on the petition eloquently, his objectivity”” should be taken with a pinch of salt. This is so obvious. Don’t get intimidated by the prof thing he is wrong and biased. Why enshrine 14 days in the constitution if it can be respected? Great. Now put the legal argument against his. Having problem? Brilliant piece of writing from Prof Muna Ndulo. I used to enjoy reading his contributions in the then ‘real’ ‘The Post from back in the day before it became a PF mouthpiece under Sata. This is what I have been saying all week in various comments that fundamental rights, like the right to be accorded a fair trial, right to justice and right to be heard are above all other constitutional requirements. These rights are universal human rights enshrined in the UN Charter, whereas the so called ’14 days’ is just a Zambian thing and it is subject to many interpretations. What if the evidence to be presented is so overwhelming and gigantic that it could stretch over days? For me the preliminary issues raised shouldn’t have counted towards the 14 days anyway and weekends should have been excluded since they are not hearing the trial. Ok Mr. Learned Professor sir, tell us why the 14 days limit was put in the constitution. Is it important or not? Or are people just imagining that it is there to start wirh? This person is a professor and that is why I will never be a professor. I can not be foolish like this lunatic. he is actuated by the same spirit as tribalist. This guy is a secessionist. that is where draws his inspiration. failed state? walipena? violence everywhere? where? wembwa yamuntu iwe! Ati Professor, where? You are just a M’membe’s Chola boy and there is nothing you can tell us in your shackles. 14 days simply mean 14 days period and today’s sitting by Concourt is ILLEGAL. Sounds like the Prof is on the petition side as gleaned from this line: “There appears to be a morbid fear of the evidence to be submitted coming to the surface and hence the strenuous efforts being made to prevent a hearing of the petition.” Only an insider petitioner can speak like that. My considered view is that Ndulo sacrificed objectivity at te altar of political expediency the moment he keyed in this line. Just wondering, is the Prof a practising lawyer? He sounds like a pure academician with no ZIALE credentials. The celebrated English novelist Charles Dickens might have been right when he pointed out the A PROFESSOR IS A PERSON WHO KNOWS TOO MUCH ABOUT ONE THING, AND TOO LITTLE OF ALL OTHERS. @Chalo Nkhanza you are right on. This guy should have focused on discussing the merits of 14 days. Is he saying the court that initially ruled that the 14 days ended Friday was afraid of the evidence? Such shallow political statements puts his motive in question. Ni chi UPND cadre naimwe ichi…just read between the lines, leaning towards a certain region, what a shame of a Professor! You don’t inspire! ITS LIKE LUNGU AND HIS PEOPLE DO NOT UNDERSTAND THE PHRASE AND LAW LANGUAGE. I BELIEVE THIS IS CLEAR AND WELL STATED. IN FACT NONE OF THE PETITIONS HAS BEEN HEARD AND TRIED BY THE JURY. WHAT IS SUPRISING IS THE NOISE FROM THE PF NOT READING BETWEEN THE LINES. I PRAY THAT JUSTICE PREVAILS OTHER THAN PUTTING ZAMBIA ON FIRE BECAUSE OF BLOODY EYED PEOPLE. IN FACT PRESIDENT LUNGU IF HE WAS WISE ENOUGH, HE SHOULD HAVE STEPPED ASIDE TO GIVE ROOM FOR THE JUDGES TO PERFORM WELL IN A FREE AND FAIR ENVIRONMENT. WHAT IS HE AFRAID OF WHEN HE WAS THE ONE WHO SIGNED THE LAW WITH HIS EYES CLOSED? ONE THING IS IF LUNGU BRINGS THE COUNTRY TO BLOODSHED, GOD’S EYE SHALL BE ON HIM AND WILL NEVER HAVE PEACE FOR THE REST OF HIS LIFE AND HIS FAMILY TOO. Professor this hullabaloo academic arguments do not mean much to a lot of us who want to see immediate action from the courts. It is the courts that made a decision to conclude before midnight or by midnight so that they stick to constitutional requirements. Your article would be good for a University bulletin. And sorry to say, my observation is that these arguments would go on and on and on depending on where your allegiance falls. Remove allegiance and stick to objectivity. Do you reckon the decision to go against your own ealier decision in just a matter of hours is a good precedent for the honourable judges? Especially that the plea to the Judges was done in a non-conducive manner and to me that is unfair influence on the Judges. The regionalists failed to present the evidence through their time wasting tactics and incompetence. The court misdirected itself by extending the time limit. ECL LAWYERS SHOULD WALK OUT TODAY. WHAT PROOF DO YOU HAVE? LET THE LAW DO ITS WORK AND IF LUNGU WON, THE THE MANTLE GOES TO HIM. BACHILANDELANDE NIMWE MULULETA. YOUR MINDS ARE SHALLOW AND HAVE STINKING WITH RUBBISH. BO MUNA NDULO ,DO NOT INTIMIDATE US BY YOUR TITLE OF PROFESSOR. IN FACT THERE ARE OTHER PROFESSORS ON THE OTHER SIDE OF THE DIVIDE. PROF MVUNGA BEING ONE IN THIS CASE. YOUR POLITICAL INTERESTS HAVE CROWDED YOUR REASONING. SO SHUT UP. UBU EBUFONTINI UBU. THERE IS NOTHING SENSIBLE IN YOUR MIND DEAR. REASON WELL AND DO NOT JUST TALK ABOUT PERSONALITY BUT TALK ABOUT ISSUES CONNECTED. IF YOU DO NOT HAVE ANYTHING SENSIBLE PLEASE KEEP COOL. TATULEFWAYA INSELE. Sounds like an article written by a first year law student to me. I do not see any legal or logical arguments that one would expect from a Professor. The opening is also highly misplaced… You can’t call isolated incidents of violence as violence everywhere, C’mon Prof! Ebu professor bwa mafi ubu. Why even pick up a pen and pencil and start writing amafi yekayeka. The constitution gives the Con court 14 days to hear the case and people must inaugurate their leader who got 50%+1 or go for a rerun finish. If in 14 days the case is not concluded, there is no petition at all. The petition has broken. It dropped and broke. The judge should just make an official pronouncement. GBM and HH what they want to see is that ECL does not hold power even if they themselves do not have it. Elo ka professor just because of the leakage kalati nyanyanya. professor just go to the toilet if you fill like diarrhea. I take exception when people call my country a failed state. Was the USA a failed state during the Al Gore Bush saga? Is the USA a failed state because they have allowed a demagogue to run for presidency? These inferior self hating individuals ought have some introspection. I love my country. A Tonga will rule Zambia one day and move on to the next president but Zambia shall remain. Subscribing to the notion that one tribe is more intelligent than another is admitting that Blacks are inferior to other races. Well said @Nono. By the way any relationship with the once poerful Bashi Nono? Lol. Well put. Zambians have a way of trashing their country. This country has made progress compared to most countries in Africa. You cannot compare Zambia to any of the failed states in Africa. Long live Zambia. This article can only inspire those in Dundumwezi to say but the least. They are both HH’ s bootlickers. ..
Too many statements are being released! No wonder people are unsure at what is occurring. The only issue is whether the case brought by UPND is justified, is well evidenced, is procedurally correct. So far no! It has not been filed correctly as witnessed by the Applicants do the case requesting an alteration to their original skeleton argument on which they received permission to proceed with filing the case! These issues are what we should all be discussing. The case is in the Concourt, the applicants and the respondents have accepted the constitutional basis for the case. No KACHOKWE, No MBUNDA, No LUNDA, No LUVALE Will ever be PRESIDENT in the next 150years. Actually no tribe from NWR (TONGA, LOZI, LENJE, etc) will ever rule. That’s what we are being told by the events of the last 3 weeks. Tribalism has become institutionalized. Even if you win, there’s ECZ to filter you out. Even if you despite the results, there’s KangCourt to filter you out. One Zambia. One Nation! Some Zambians are more Zambians than others! I always get embarrassed as a Zambian to read hallucinations in subjective articles about the state of affairs in our country to the extent of even saying Zambia is a failed state! How unfortunate coming from once esteemed professor. Who feeds you such information? BTW the law is there to create standards. Art. 101(5) of constitution is clear even to me that petition must be heard within 14 days from filing. Petitioners knew this even b4 filing. What justice & fairness are you talking about when this law creates a standard for everyone? You’ve clearly lost your usefulness, objectivity & independence which moved you in your youthful days! The truth as it stands – and in agreement with the presumption of one (paraphrase Lungu) being innocent until proven guilty: Lungu walloped all presidential pretenders put together by around 30,000 votes. And between ECL and the runner-up there exist a 100, 000 vote difference. Isn’t this like a Usain Bolt performance? Prof what is the overwhelming evidence that you are imagining?? Preventing a failed state by prolonging petitions which can be as petty as this one. Maloza, no matter where you hail from, you can be president in Zambia as long as you meet the constitutional requirements and give it a go. Being a backyard complainer won’t make you president, what will is for you to sell yourself properly to the voters; there’s unlimited votes waiting for you out there, even in Dindumwezi. But first, cure yourself of bitterness and God will do the rest. Signs are that you don’t try as hard or the field won’t be crowded only by Easterners and northerners each election year. Kupasa mimba niku yesako, not pakamwa chabe ati ine nimbala. Yai. presidential elections was not complied with. If today I say that prof. Ndulo got his academic papers through plagiarism, does that make his papers fake based on my suspicion and superstition, or the matter has to be proven as such? I am failing to understand what the Professor is trying to put across. Over the weekend, I had problems in understanding Dr Venon Johnson ‘Mwaanga’ when he said that the 14 days was unrealistic. But what is realistic, is it a tribal grouping that is realistic? I n my opinion, they should have applied for adjustment of the 14 days at the time this constitution was being drafted. Now, because they are affected in one way or the other, we hear such negative utterances. May God save Zambia. Ndulo is entitled to his own opinion, and that should not be misconstrued as facts. I used to have respect for this academician, but he has proven that he does understand our constitution after all. It is sad when ones opinion is viewed through the lenses of ethnicity. Even the little theories he is trying to allude to, do not sit well with ConCourt decision to act ultravires. I challenge the learned justices to correct themselves and preserve the constitution upon which they swore to defend. When interpreting the law, the courts should critically analyze the framers intent, and not their own opinion. I was enjoying the article until the good professor put in the following “There appears to be a morbid fear of the evidence to be submitted coming to the surface and hence the strenuous efforts being made to prevent a hearing of the petition”, then I realized where the professor’s political inclination lies. The constitution allows the petitioners 14 days to present their evidence and we all know what they were doing in that 14 days. Nobody, Mr Professor, stopped yr colleagues from presenting their evidence within the constitutionally provided time. IT IS DONE…ECL is going for the INAUGURATION! Now this is an argument worth reading, from a properly learned lawyer. Compared to the empty rantings of one failed general, who always wants to show us that he knows one or two things about constitutional law, this article is straight and to the point. Thanks Prof, you have always been a source of necessary wisdom. I hope the retired general reads this article and finally goes to sleep. Muna Ndulo is a sycophant who accidentally found himself teaching law. He has never been a judge but an armchair critic. We are talking about a country where judges have the impunity to overturn their own judgment without shame. When they were passing the first judgment they were not thinking that 23.59 was going to come. After 23.59 hrs, and if they wanted an extension, they had 59 seconds to add on. This case is being taken casually. There are those, like Muna Ndulo, who don’t see any urgency in the disposal of this matter. Peace for Zambia – Tondolo musuma not ukuyisebanya pebumba! I know that you need to vuvuzela for Lungu to earn a living but please have some decency to only comment on issues that you are capable of understanding. 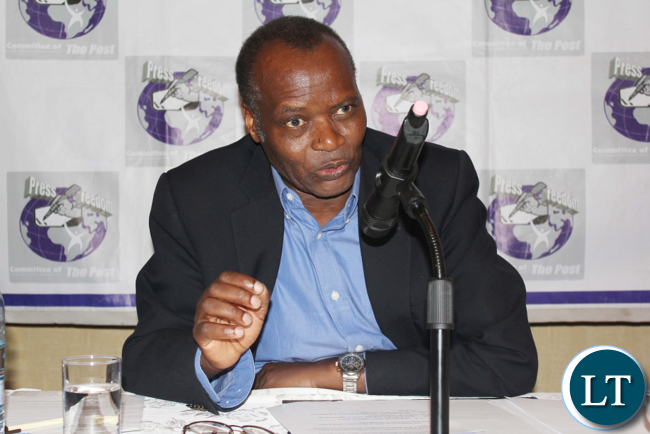 Prof. Ndulo is a highly qualified and experienced academic in both Zambian and international law. You sir must choose another tune and style to dance for your dinner from Lungu’s table in a true sebana wikute! What a shame! Please, Ndulo, Zambia is not a failed state. Continue looking around the world for a case of a failed state. Your definition does not come anywhere close to the state we are in Zambia. Cornell University is indeed very far from the realities here and understandably yours are ideas that are based on theories, recorded in books already. You join a bunch of so called academicians who have fled their home countries and shamelessly never in the lecture theatres, talk anything good about their country. It doesn’t help to be in denial.Look around you.its written everywhere. Do not mind Muna Ndulo’s definition of a failed state. He has never read about Max Weber’s defining feature of a state for him to think Zambia is a case of a failed state. It is the problem of a law professor being ignorant of so many things outside his legal profession. Ok Petition has been thrown out. Inauguration now can take place for EL. Praise God Zambia is advancing now. Let the petitioners be heard. People just want to know the truth. Did Lungu win the election fare and square or did he steal votes from HH? That’s all there is to it. There’s no need to spend so much time farting around this issue just because the defective constitution says 14 days! The petitioners have a right to be heard. We also know the elections were not free and fare given the opposition were blacked out, Lungu promoted violence, abused public property to campaign. The Constitutional court says it does not have the jurisdiction to hear the petition after the expiry of the 14 days. There were five judges on the panel, three judges Mungeni Mulenga, Palani Mulonda and Annie Mwewa Sitali agreed with PF lawyers that the petition should not be heard. Two judges Munalula and Hilda Chibomba dissented and argued that the petition should be heard but were outnumbered. Judge Chimba said “I should have allowed that the matter be heard but because majority judges carried the day’. It is Dununa Reverse! This had to come to an end. It is not a research but a lot is at stake. Thumbs up for sound Judgement from disgraced Judges. I urge all the 6 Concourt Judges to step down despite this momentous decision. Justice has been brought to scrutiny for the first time in Zambia. Viva ECL Viva Inonge. The presidential petition has just been dismissed on a 2-3 vote by the con court Judges. There was jubilation by PF ministers and everyone was shouting game over. PF members walked out and were seeing celebrating outside. The court says it does not have the jurisdiction to hear the petition after the expiry of the 14 days. I was having my breakfast when I started reading this article. Believe me, I vomitted my nice breakfast. 1. Just reading the rubbish in the first paragraph gives the poor “Professor” away. It immediately reminded me that the writer is a party cadre and I thought that I should not comment but wait for the other one Prof Hansungule to comment before I gave my views, but no I am intelligent enough to know that I am time bound. Obviously this guy has declined to carry the title of professor so I will address him by his name. 2. Was Muna Ndulo writing the article for his students? If so, the American Ambassador Mr Schultz must be shocked and worried for the American law students at Cornell university. I hope that the law graduate President Obama was not subjected to such trash. 3. Was Muna Ndulo writing to the Zambian audience then? He is not too intelligent then, seeing that we are in the country and so we have the arguments at our fingertips. Clearly we know the case betterbthan Muna Ndulo. 4. For example we know that both the petitioners’ lawyers and defendants’ lawyers, as well as the Councourt judges all agree that the petition is time bound by the constitution. The issue at hand is whether the 14 days includes Saturdays, Sundays and holidays, i.e. is it calendar days or weekdays? In Zambia we are lucky to have KK still here with us and God has rewarded him with long life for his selfless work in uniting this country. Let’s not let the old man’s struggle be in vain. Let’s be united as Zambians what ever the outcome of this petition. Let the elections of this country be a competition to make our country better, not a platform to experiment with evil. We will sing and dance during elections but once the elections are over, let’s learn to move on so we can see a better tomorrow. My thoughts and prayers are with Zambian people. Together we are known as the Zambian tribe full stop. 5. The parties all know in their hearts that it is calendar days because all their legal documents at their firms would stipulate 14 working days if they wanted to exclude weekends and holidays. On the contrary Muna Ndulo is so ignorant that he not only does not mention the interpretation of the 14 says at issue, but worse and shockingly he claims that the petition is not time bound and thus can go on forever as long as the lawyers want to continue arguing. 6. Shocking indeed and that is why I vomitted all my nice breakfast. 7. Thank God he is not teaching Zambian law students. 8. By extrapolation, the rest of Muna Ndulo’s article is not fit for further comment, it is only fit for the trash bin for onward transport to the city’s garbage dumping site. As for bloggers who are misled by this trash, I suggest you go and dump yourselves at the same garbage site, you are worth tax payers’ transport to the site. 9. As for the Concourt judges, I pray that you were not somehow in your careers taught by this lumpen Muna Ndulo, otherwise I strongly recommend that you resign immediately and go back to university and law school and start all over again. This partially explains why you can overrule ourselves without seeming to know what you had earlier passed. Evil has prevailed. Let it rule yet for another decade at the minimum. Evil is what has ruled us for the longest part of our lives. Let it continue. 10. As for those brainless comments that the earlier ruling on Friday morning was passed by Judge Anne Sitali (whom they now call Judge Anne Mwewa for reasons known to all of us, tonga tribalism of course that is what I am saying), the ruling to end at midnight was actually passed by the full bench of the Concourt presided over by Judge Hilda Chibomba herself. Please tell me if Chibomba has another name too, you tribalists. 11. How GBM fits into all this UPND tribalism against his fellow bembas is beyond comprehension. I thought these guys would at least recognise tgat the UPND leadership andvmembership comprises tongas, bembas (GBM), ngonis and other tribes. Or is there something that GBM and the rest of us do not know? Like an inner circle perhaps? I have read with trepidation professor Muna Ndulo’s description of Zambia as rapidly descending into a failed state in regard to the perceived constitutional crisis. Nothing could be far from the truth – Muna Ndulo unfortunately has unconsciously started chipping from his status as a world renowned constitutional expert. You do not need to be a rocket scientist to know what a failed state is. @68, I c one clear differentiator between yours and prof ndulo’s Statements. NDULO uses his HEAD to define a failed state; YOU, Google! WTF: You check-out history in part at least over Google but NEVER for CURRENT AFFAIRS…Jesus wept, get out of the kitchen !! …Know what, check-out Miyanda’s Argumentation here on LT – like u, he’s been in Zambia practically all his life, soldier, vice-president, taxi-Driver and studied BTW law. Read that blog and u just may see how wrong you are. Onceupon a time there came a beast from Vienna to Germany and the rest is horrid unforgettable history; in Salisbury came one sekuru Bob in 1980 and he farts on – we were lucky to have peacefully and democratically changed governments since 1991….if you don’t see Armageddon in this mess ECZ,ECL and PF have constituted with the collusion of “Hitler-Youth” myopics, then you’ve hardly learnt what zambia COULD HAVE BEEN !! …maybe, just maybe you will endure WHAT ZAMBIA WILL BECOME after this day, or maybe just maybe u belong to the zambian Version of the “Hitler-youth”, then enjoy yo roller-coaster – struth !! This guy Ndulo is incompetent and I cant allow him to teach my kid law. Who told him that Zambia is in a failed state? Who told him that there is a crisis here? Who told him that the Concourt has jurisdiction ti extend the 14 days? I wonder wheather is teaching or cheating law! I spoke to a professor friend of mine on the topic. He says that he is embarrassed by Muna Ndulo. I am disappointed that a so called professor can use tribalism to think, for that is the only explanation for this, for someone of such eminence to sink so low that even street kids are shocked ati ni ba professor aba? Muna Ndulo, muna ndulo? what a shame you have brought to professorship and academia in general. There is no failed state in Zambia, instead what we have is a failed professor, yourself! It’s difficult argue to with such a highly acclaimed personality but not impossible to ask what’s good is consititution if it can be bent to suit an individual? It is him Muna who has a failed mindset! How does he reject the zambian Law which he has ignored to participate in making judicial laws. Bemba’s say ubupuba tabulya, wayatashya in’ganda yamunobe wasula ukowafuma shame…! What violence everywhere, breakdown of law and order? Prof how is intake of own vomit? The prof is human after all and though he wears the tin amour of being a professor in law, an ordinary arrow from a skilled archer has pierced through to expose his unflinching tribalistic inclination. I have lectured many students, including foreign students and if this article was an attempt to an academic submission I would have already sent him to Chimbokaila strapped in shiny handcuffs for such an abuse. Sorry UPND cadre Ndulo. All your diatribe amounts to rubbish. The professor has greatly disapointed me.after reading zambian watchdog,he thinks zambia is a failed state?too bad for exposing his ignorance.its sad that he was commenting on things without facts.who delayed the petition hearing?the answer is well known unless you do not stay in zambia then we all know which media house fed you the data. Moreover,how can a pure unpd cadre claim not to be baised.we all know the prof is a pure pure unpd cadre?isn’t this article meant to discredit the concourt?lets show love to this nation,but alas that is why he would rather be somewhere other than zambia.we have alot of *****s pretending to be giving free advise when in fact they are just giving support as cadres to one Hakaivotela Heka(HH). Preffesoro, you are day dreaming. In other words I would say you are speaking on behalf of the aggrieved who are happy when things seem to be on their side and Not when Not. Zambia is peaceful except for one or two individuals who have chosen to experience havoc within themselves. How dare you say “Zambia is a failed state” when not. Prof Muna Ndulo’s comments are misleading. Constitutional Court is one of fast track (express) courts & is meant for petitioners with easy to prove cases with tangible evidence at their finger tips, because the court’s mandate is limited with time. A person like you, should understand that since UPND had 80 determinable grounds which needed to be determined, they should have petitioned to high court or onother court which could have given them even 10 years to hear from both sides. Is it justice to keep the respondents’ minds imprisoned beyond the 14 days mandated period just just to satisfy petitioners? Both petitioners & respondents have rights which need to be protected but not to be abrogated to add more rights than entitled to by one party.